Marinate duck, inside and outside. 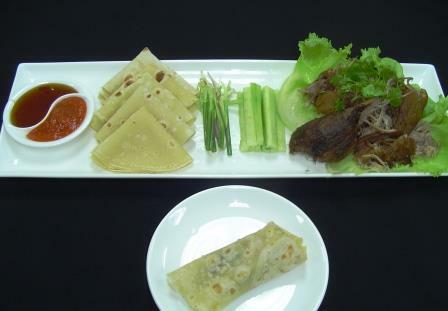 Place the ginger slices and spring onions in the cavity of the duck. Leave the duck aside for about 5 to 6 hours, or preferably overnight, in the refrigerator. Steam the duck for about 2 hours until duck is tender. Remove and place duck aside to allow the duck to dry. Remove the ingredients from the cavity. Give the duck a light brushing of light soy sauce and coat the duck with plain flour. Stir-fry 2 tbsp fine salt in a clean and dry wok over a medium-low heat for 2 to 3 minutes, or until salt turns lightly golden. Turn off the heat and add in 1/2 tsp “five spice powder” and a dash of pepper. Mix well.